These Plates are Adapter Plates and 2nd Ski Kits for both Telemark and Dynafit Backcountry Bindings. At Dobish Solutions, we are passionate about backcountry skiing and want to get as many people out as we can. We have developed a plate that can work with 2 sets of bindings, or as a 2nd ski kit, to eliminate multiple setups! 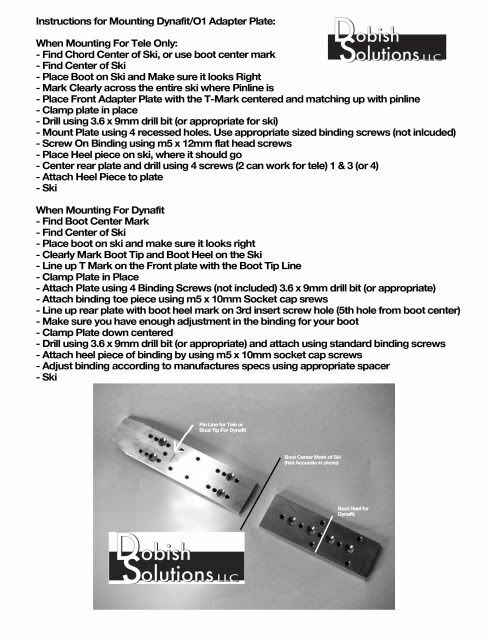 Mounting pattern: 4 hole tele/ 4 extra holes in heel. Please complete the fields below and we will respond to your inquiry will contact you within 48 hours to answer any questions you may have! Thanks for your support!